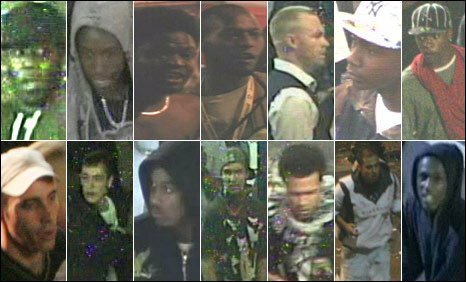 Police have issued images of 14 men they want to speak to in connection with an attack on officers at the end of this year's Notting Hill Carnival. Officers were pelted with bottles in a two-hour stand-off at Ladbroke Grove at the west London event in August. Deputy Assistant Commissioner Chris Allison said 39 officers were hurt. "Those responsible for the violence need to know that we will identify them and take them before the courts, however long it takes," he added. Officers clashed with about 40 people in the stand-off on 25 August. Most officers sustained minor injuries but one had to have 30 stitches and surgery to his face. Members of the public were also caught up in the violence as they tried to get home from the event. Mr Allison, who was responsible for policing the carnival, said those involved would be prosecuted and police would seek ASBOs banning them from future carnivals. "Carnival is a unique, vibrant event that should not be marred in this way, and officers who are there to protect the public should not become the focus for mindless violence and aggression," he said. 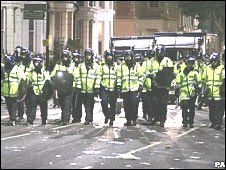 The Ladbroke Grove stand-off came after about 180 people clashed with officers at south London's Oval cricket ground as police stopped them from going to the event. A total of 330 people were arrested during this year's carnival with weapons such as knives, a Taser gun and CS spray being seized.